It has been a long time I kept waiting for this moment. I have been a user of the Wacom Intuous Tablet for many years now. I have always missed the feeling of painting and sculpting directly on screen. Although I have gotten used to working with it, it never felt as drawing on paper. 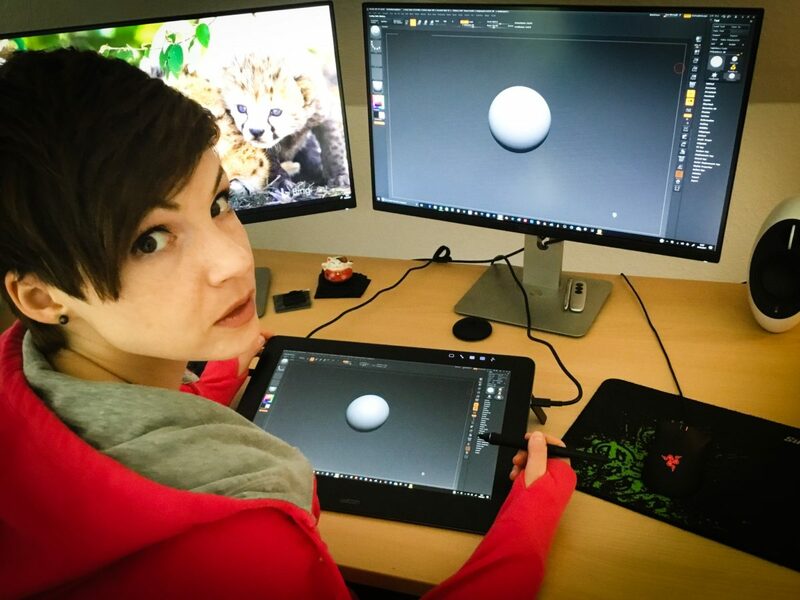 There have been several options on the market for quite some time like the Cintiq 22hd or 27qhd. However, I felt that the displays are rather expensive and besides that they are just to big in size for a smaller person. With the new Cintiq Pro 16 I felt that this would be a size I could comfortably work with. As another plus, the display comes with different color spaces and brightness/contrast settings that better match the sRGB colorspace I am used to with my monitors. 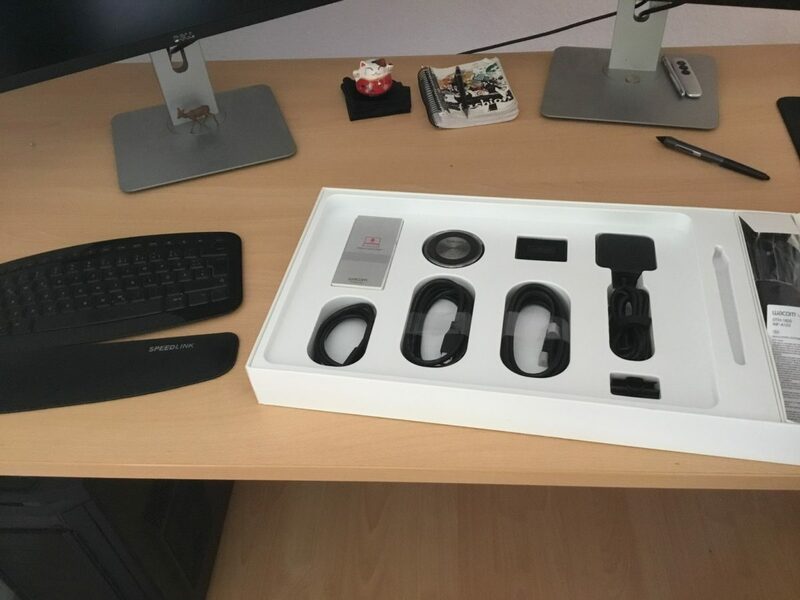 After opening the package you will find the adapter and complementary wires to setup the display. An important first step would be to figure out if your computer has a miniDisplay port. What should be natural to Mac users can pose an issue to PC users. My Nvidia 780TI graphics card only provides a standard display port, HDMI and DVI connection. Nothing that would help you with the Wacom. 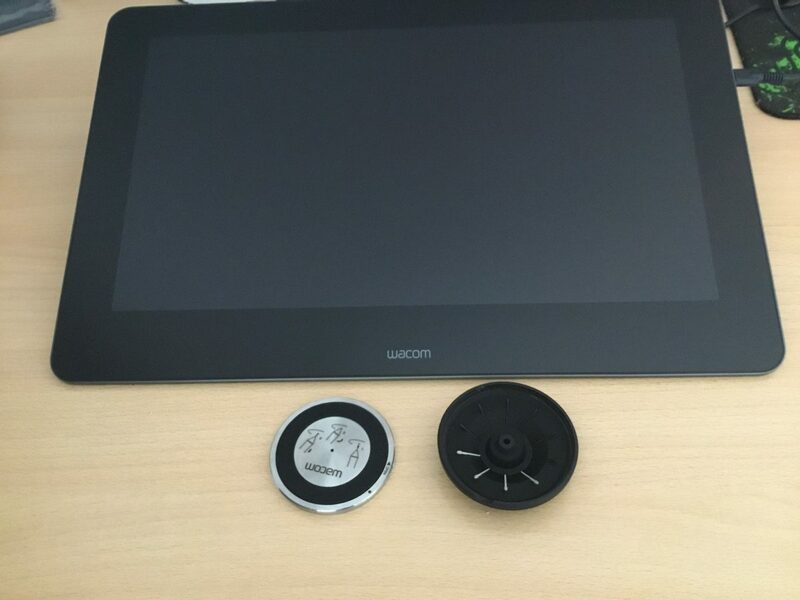 I would have preferred if Wacom would notice that in the product description. The solution is simple, either get an adapter to connect the standard display port with the Wacom connector or, like in my case, just get a display port to mini displayport cable. Again, the adapter is used to connect the USB-C port to the right USB-C plug on the display. The one above the SD card reader. The other side of the adapter is then plugged into the USB3 and the displayport cable. After connecting those 2 to your motherboard and your graphics card you would be ready to start the display. Wacom supplies a small leaflet that depicts this process. In my opinion they could have spend a little more time to explain it a bit better but there aren’t so many options you can hook up the display anyway. A nice feature is the the pin tip box. This small radial device can be opened by turning the surface counter clockwise. All the pen tips are stowed away neatly. The pen itself can rest on either this holder or a little clip that can be attached to the display. All these options will keep your desk nicely organized. After everything has been connected the driver must be installed. With the latest version of Wacom drivers this wont be a big deal since the application automatically detects the pen display. In my case there wasn’t any download necessary. In case you need to download, Wacom provides the Drivers here . 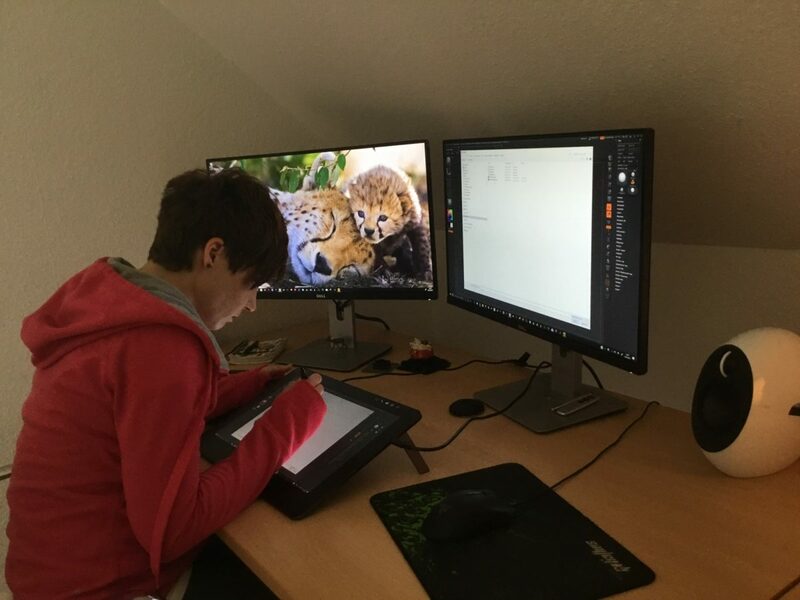 One important step was to sync my monitor with the pen display. This can easily be done in the windows display settings. Simply right-click the Windows desktop and choose display settings. After that I opened the pen settings. This can be done either using the Driver app or with the quick touch icons on the display. I like to set my pen to “shift” and “doubleclick” for sculpting. Aside from the “settings” touch-button you can also use the touch buttons to open and close the keypad or turn the touch function on and off. This comes in very handy. The final step then was to calibrate the display via the driver app. This is a 4click easy process. After that simply adjust the display to your preferred color space and brightness and then your done. As expected ZBrush works like a charm on the display . There is virtually no parallax and no lag. The surface of the display feels very smooth and paper-like as expected. 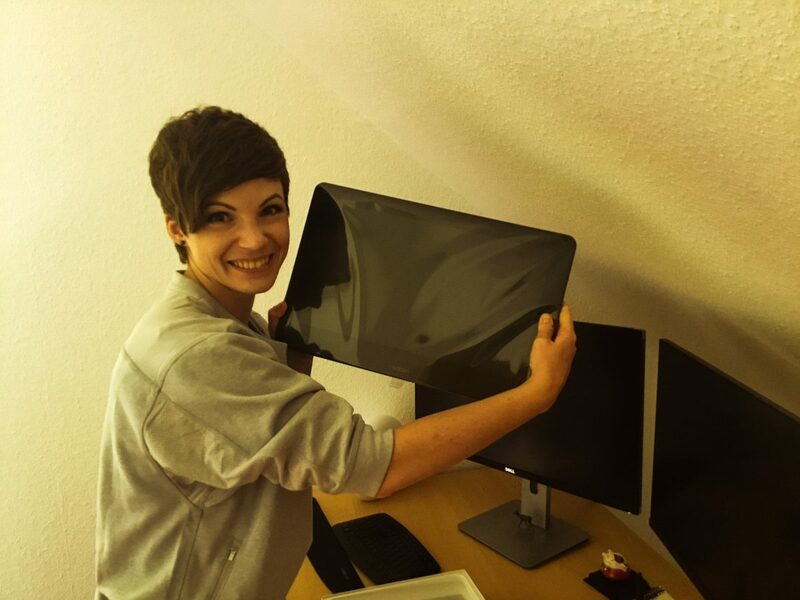 One big advantage in my opinion is the 16″ size. I feel it is ideal for sculpting. When using ZBrush I depend on my keyboard. My keyboard fits nicely on the desk a little underneath the display. This allows me to find all my shortcuts. I can sit and work comfortably without strain or fear of tiring my wrist because of an awkward position. Another first very nice impression I want to share is sculpting high frequency details. This might be one of the most important benefits compared to my old Intuous. Working on screen feels more fluent and natural. It eliminates any guesswork or haptic acrobatics to get precise detailing work done. Altogether the first couple of hours working with the display felt great. Can’t wait to test it on the current ZBrush projects or other drawing application.